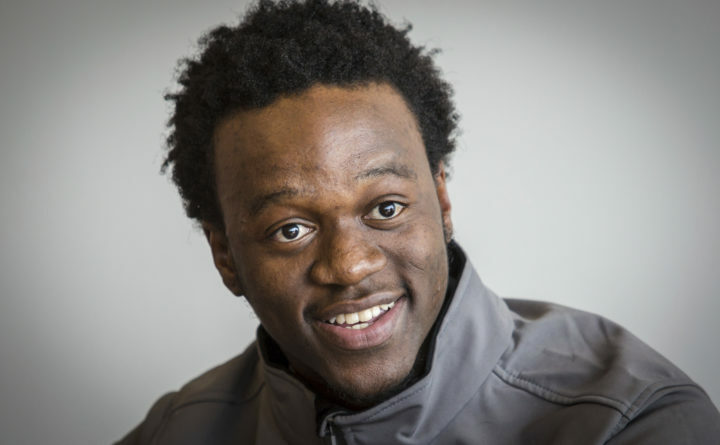 In this April 12, 2018 photo, Allan Monga, 17, a high school student who fled his native Zambia, recites a poem during a news conference in Portland, Maine. A federal judge Friday ordered the National Endowment for the Arts to allow a Portland immigrant to participate in the national Poetry Out Loud contest. Allan Monga, 19, of Westbrook, last month won th e state P oetry Out Loud contest, sponsored in Maine by the Maine Arts Commission and nationally by the NEA. The poetry recital contest rules require participants at the state and national levels to be citizens of the U.S. or permanent resident aliens. The ruling, issued about 4:30 p.m. by U.S. District Court Judge John Woodcock, means that Monga will compete for the national title next week in Washington, D.C.
“Although the NEA references federal statutes as suggestive of congressional intent, there is no congressional enactment that requires it to impose these citizenship or permanent resident requirements to the [Poetry Out Loud] competition,” he wrote. The NEA argued that it had used the citizenship qualifications set by Congress for the National Medal of the Arts is setting citizenship qualification in its rules. Monga’s attorney, Melissa Hewey of Portland, expressed gratitude to the community for its support over the past week or so since the lawsuit was filed. “Allan, the Portland Public Schools and the lawyers at Drummond Woodsum who have the privilege of working on this case are grateful for the outpouring of community support for Allan and for the thoughtful and detailed decision issued by Judge Woodcock in a very short time frame.” she said in an email. Monga, who moved to Maine from Zambia last year, has applied for asylum but has not yet received a green card. He and the school district sued the NEA in U.S. District Court earlier this month for not allowing him to compete at the national level. The lawsuit claimed that by not letting Monga compete, the NEA is violating the equal protection clause of the 5th and 14th Amendments and Title VI of the Civil Rights Act, which prevents discrimination in education, among other things. Woodcock held a hearing Wednesday in U.S. District Court in Portland on a motion for an order that would force the NEA to allow the Deering High School junior to participate. The judge did not rule on the underlying issues in the lawsuit. The case is expected to go forward later this year. Woodcock said in his 39-page order that Monga’s attorneys had shown that the student would be harmed by being excluded from this one-time opportunity to compete on a national level. The judge left open the possibility that with more time for legal briefs and arguments, he might not order the NEA to change its rules going forward. “The court leaves for a future date, when time constraints are not so pressing, a more measured and sober determination, informed by further argument from the parties, of the important issues at stake in this case,” Woodcock wrote. The Maine Arts Commission ignored the citizenship eligibility rule and allowed Monga to compete, attorneys for the NEA said in court filings. The commission also did not replace Monga with the runner-up as the NEA instructed, according to court documents. The state organization’s website says participants must be citizens or have green cards to compete in the state final. Through his attorney, Melissa Hewey of Portland, Monga said he was too busy preparing for the national contest to meet with reporters Friday. A public affairs officer for the U.S. Department of Justice, which represented the NEA, declined to comment on the decision. Monga chose three poems to memorize and recite — “In The Desert” by Stephen Crane, “The Song of the Smoke” by W.E.B. DuBois and “She Walks in Beauty” by Lord George Gordon Byron. A total of $50,000 in awards and school stipends are given at the national finals, including $20,000 for the national champion, according to the lawsuit. Participants are to arrive Monday in the nation’s capital. The semi-finals will be held Tuesday with competition for the northeast set for 9 a.m. The contest will be live streamed at http://www.poetryoutloud.org/competition/national-finals. The finals will be streamed at 7 p.m. Wednesday on the same website.